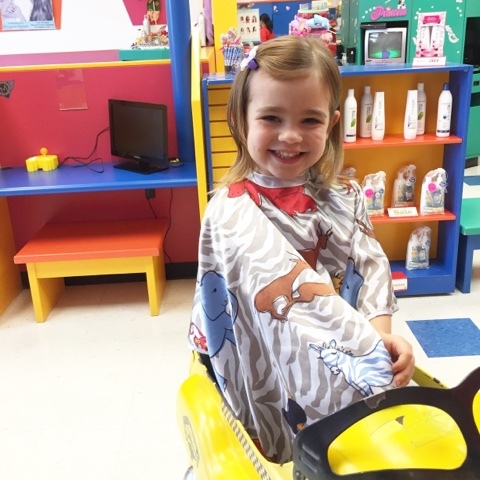 House full of Huff's: Abigail's First Haircut! 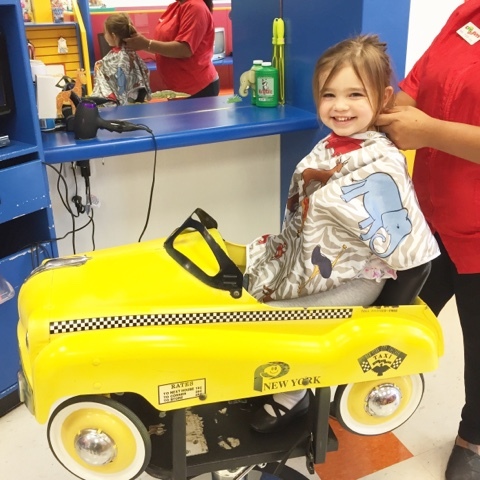 It took me three and a half years to take my girl to get her first haircut. Sometimes I feel like I hold on to sentimental value of weird things. 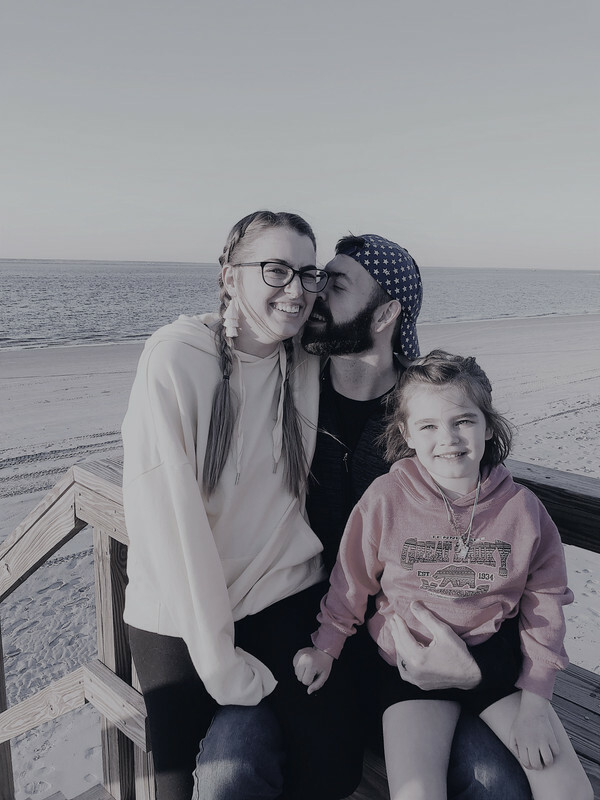 When my sister found out years ago that she was having her first girl, I didn't hesitate to give her everything I had accumulated for Abigail that we didn't need anymore. I didn't hold on to really anything. But when she asked if she could borrow our crib, I told her no. I didn't want to part with it (even if it was just to borrow) and I didn't want anyone else sleeping in it. It meant too much to me (before you judge me for sounding selfish, she has literally NEVER bought that child an item of clothing because of all of Abigail's stuff, so she's doing ok ;) ). I felt the same way with Abigail's hair. I did. not. want. to get. it. cut. I don't even have a reason why. It just seemed like such a big milestone that I wasn't ready for. I'm so glad we waited until we were both ready, but goodness was it over due! Her 'before' hair started to get really scraggly and wasn't growing at an even length. 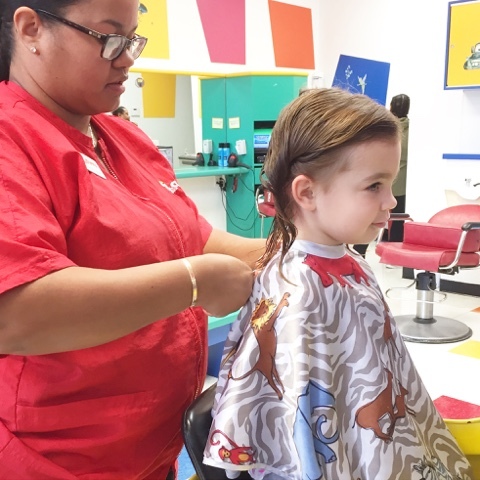 She had so many baby hairs still that when we walked into the salon, the check in person didn't even have to ask if it was her first haircut, she just knew! 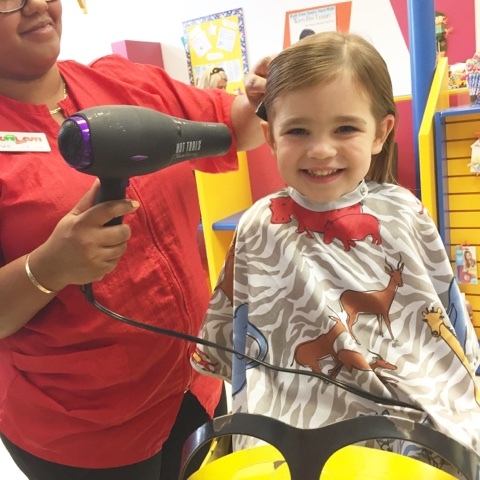 We didn't know how she would do with letting someone cut her hair. I was relating it in my head to the same experience we have at the doctor or dentist office - which is absolute hell for all of us. BUT, she was SO excited and did better than I could have ever imagined. 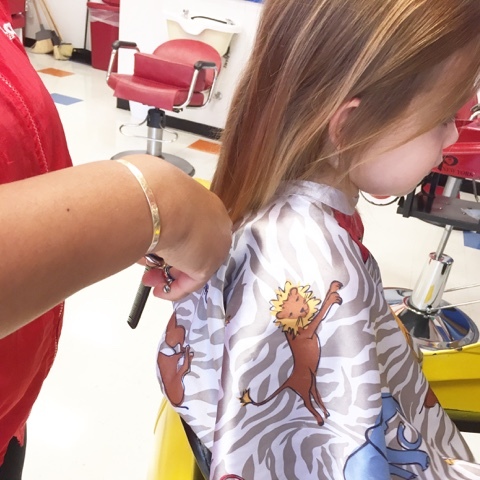 Even the sweet lady cutting her hair kept saying how good she was! They saved this lock of hair for me and gave me a certificate to put a picture in. She sat like this the whole time. With a little smirk on her face. I think she felt like such a big girl. She loved every minute of it! She picked her purple bow. I love the side eye she's giving! All done & all smiles! I took these two pictures the next day. She still has a lot of baby hair in the front (I had her bangs pinned back because until those grow out completely, they'll continue to just fall in her eyes) but the back is SUCH A DIFFERENCE! 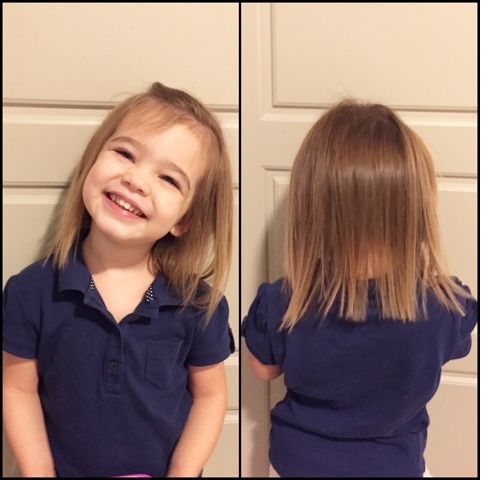 It's all straight and one length across and I don't know what it is, but it makes her seem like a completely different kid. She looks so much older! 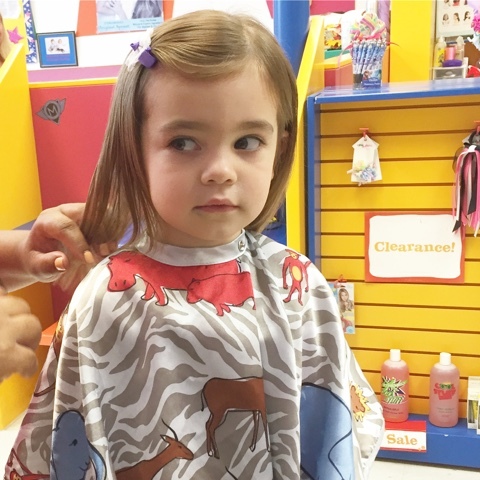 It makes me so sad, but so happy when she walks around the house, using her hand to flick her hair from under her neck asking people if they love her haircut.